Process systems have presented the greatest challenge to researchers in fighting the effects of corrosion — in economic loss and environmental safety. Cortec produces technology that offers highly efficient and economical protection for process industries. 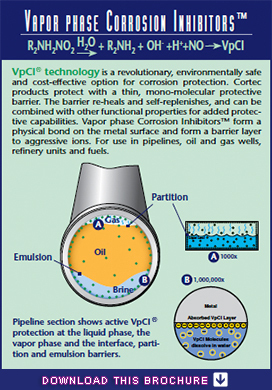 Now you can protect your process and piping systems with technology that fights corrosion. Put Cortec VpCls® to work anywhere along the line.